Introduction of a new interesting character. The narrative is gaining some momentum. Great flashback sequence. Jesus Saiz impresses with his compositions and character designs. Capucine's pursuers are a little confusing in their actions. Swamp Thing, now returned from Metropolis to the swamps of Louisianna finds a strangely attired woman named Capucine requesting his help. He receives a history lesson from the Parliament of trees and discovers more about The Seeder. After the recent sidetrack to Metropolis, Charles Soule shifts a gear with this issue which features some excellent developments. The introductory monologue which explains that despite being able to live pretty much anywhere on the planet Swamp Thing chooses to live in the swamps of Louisianna, reasserts his connection and interest in nature but also makes clear his desire for solitude which, following his recent conversation with Superman, shows they may have more in common than Clark wanted to admit. This solitude is interrupted by the strangely attired Capucine, before Holland can process what is she wants more intruders appear with less than noble intentions towards Capucine. A stranger seeks Swamp Thing’s help. 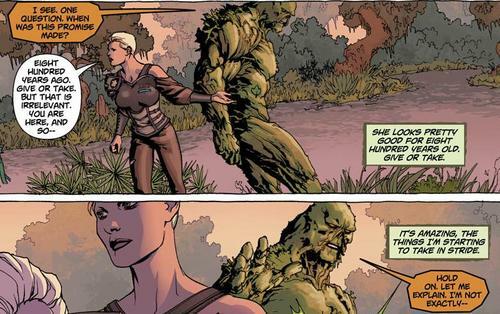 The introduction of Capucine adds a sense of mystery to the proceedings and also since Abby has become the avatar of The Rot Swamp Thing has lacked anyone to really interact with so it’s good to see some chemistry bubbling away between the two. It’s always impressive when a story doesn’t have a clearly telegraphed destination, Capucine may become a paramour of sorts, there is a potential for some sort of development as the story progresses and she seems to be too interesting a character to just be used in a throw away manner . It’s refreshing to see a female character requesting help who then goes on to prove quite impressively that they are no mere helpless damsel in distress waiting for a knight in shining armour to save them. 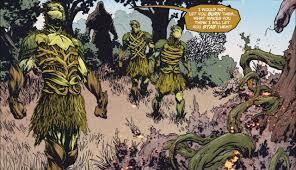 It’s this which causes Swamp Thing to become even more confused and seek council with the Parliament of Trees. The flashback to the one of the previous avatars of The Green is the highlight of the book. This unnamed avatar comes to the rescue of witches about to be burnt at the stake in France 800 years ago. This avatar has the look of a bearded monk only with his robe and hood made from foliage, it’s a great image and it is this avatar who offered the pledge of protection to any who seek it. He says to one of the raving members of The Inquisition ‘The Green world bears you no ill will, it is your choice to fear us, and those who love us’. 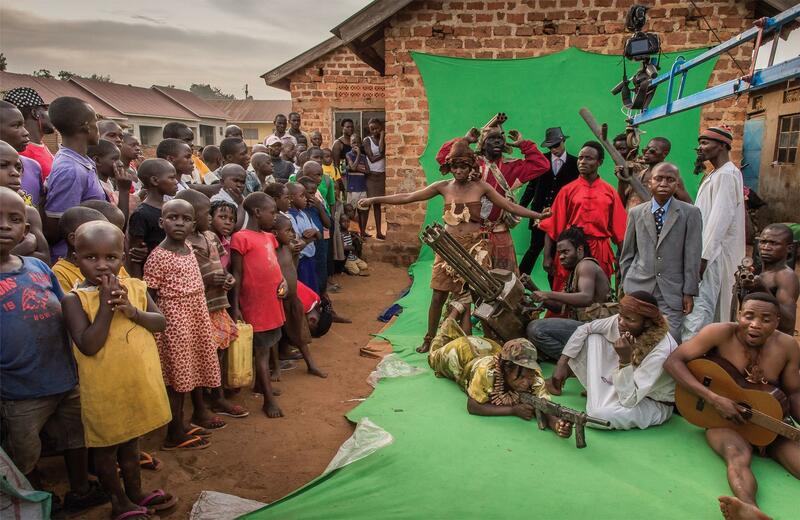 The avatar of The Green protects those facing persecution. The idea of an avatar of The Green offering protection to those that are seen as heretics and witches by the church for worshiping nature is a great connection of both a period of history and the roots of the character. The simulacra that the avatar conjures up to rescue the witches are more impressive and a great interpolation of his powers that hasn’t been seen before. This flashback which is dialogue heavy also balances out the more action oriented events with Capucine. Jesus Saiz, replacing previous artist Kano, delivers some great art with this issue. 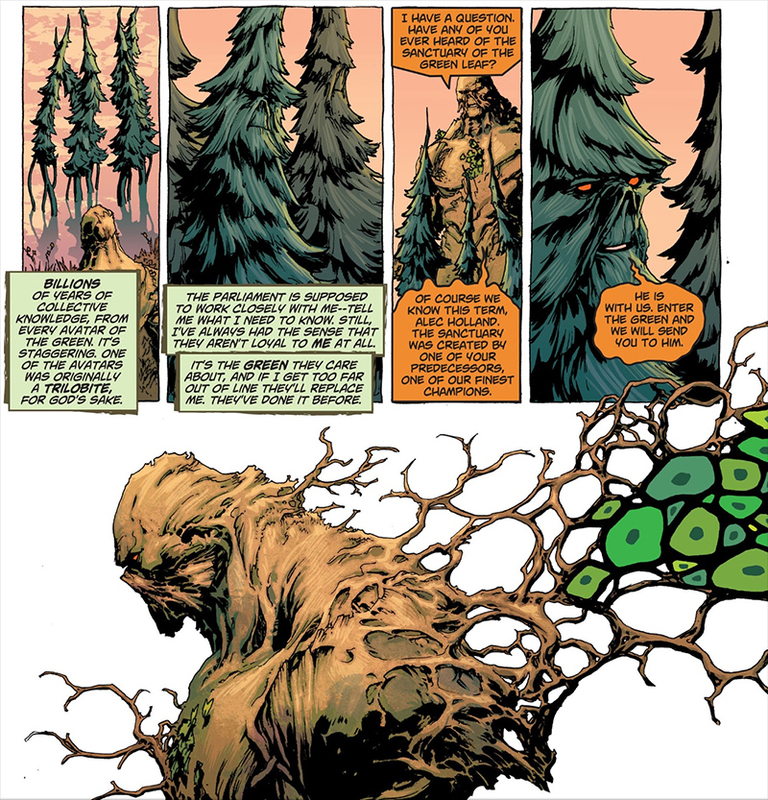 Swamp Thing’s new appearance one consisting of bark rather than the usual foliage makes for an imposing sight and the appearance of the older avatar is both impressively detailed and memorable. Other touches make the difference too, like the summoned simulacra all looking slightly different and the action with Capucine is well handled too showing a talent for composition. The cliffhanger ending also intrigues. The ever reliable Jock has done the cover for this issue and whilst it may be a little abstract it’s a vast improvement on the dire covers of the last two issues.